With the introduction of the Common Core State Standards and other college and career readiness initiatives in recent years, states are trying to determine how to best support all students as they develop the skills to complete high school and plan for their futures, whether that means entering college or the workforce. In Texas, House Bill 5 has become the state’s anchor strategy for its college and career readiness efforts. The law, passed in 2013, reduced high school testing requirements and gives students more flexibility in selecting courses for their graduation plans. Similar to Individual Learning Plans (ILPs), students choose “endorsements,” or focused graduation plans, that allow them to concentrate on long-term career goals and understand the relevance of what they are learning and where it could lead them. When Texas introduced House Bill 5, Houston Independent School District (HISD) turned to Naviance and the Career Key assessment tool. Sam Hernandez, manager of guidance and counseling, and Ray Weaver, senior manager for college readiness, had been working with the district’s Career and Technical Education (CTE) program to boost career planning with middle school students and knew that Naviance, the college and career readiness platform used in HISD’s high schools, included tools and assessments that could benefit younger students as well. The platform helps students to identify their strengths, explore their career interests, and then create education plans for high school and beyond. Working with representatives from CTE and several other offices involved with supporting middle school students, Hernandez and Weaver focused on introducing Career Key, an assessment tool in Naviance that allows students to examine their strengths, goals, skills, knowledge, values, constraints, and interests in future careers to help them make better academic decisions in middle and high school. In 2014, they rolled out the assessment to every eighth grader across the district and achieved nearly 100 percent participation in the assessment in the first year. “Students really took to the assessment,” says Weaver. “They felt that the assessments were pretty accurate, encouraging them to want to investigate more into their interests and goals." HISD staff also responded positively to Career Key. Staff members personally took the assessment before introducing it to the students, and many believed Career Key would shed light on what their students might be good at in the future by helping them identify their interests, traits, skills, and abilities. The assessment also was a good supplement to career instruction already taking place in the classroom. Although overall response to Career Key was generally positive, the rollout wasn’t without a few challenges. “We initially had resistance from some staff, mainly due to their hesitation from not being familiar with the new system,” explains Weaver. In addition, they needed to ensure that non-counseling staff could interpret the assessment results themselves to prevent overburdening school counselors. They overcame these challenges through a dedicated training effort and by going to schools for individual, on-site demonstrations. They also incorporated job-shadowing by pairing teachers new or hesitant with the system with teachers who had become experts at interpreting assessment results. One of the biggest benefits HISD has seen with the rollout of Career Key has been its influence on students’ HB5 endorsements. Endorsements consist of a related series of courses that are grouped together by interest or skill set, providing students with in-depth knowledge of a subject area. For example, if a student is interested in pursuing an engineering career after high school, he or she may want to choose a Science, Technology, Engineering and Mathematics (STEM) endorsement that includes a higher number of math and science classes as part of their graduation plan. “Although students don’t make endorsements until ninth grade, Career Key has helped our students proactively plan their high school choices,” Weaver explains. “Now every eighth-grader has a basis for their endorsement choice going into ninth grade.” By incorporating the Career Key assessment into their college and career readiness preparation, middle school students gain a better understanding of their interests and skills, and can make more informed decisions when creating their education plans for high school that will position them better for college and career. 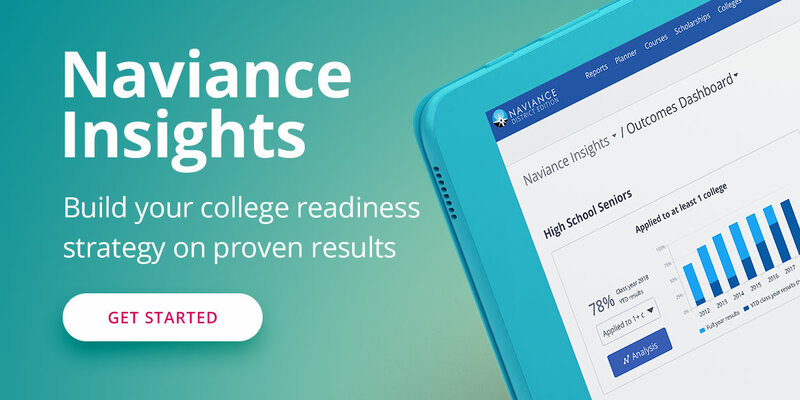 Interested in learning more about improving college and career readiness with Naviance? Contact us!